Find resources or join us as we take our children to see Europe’s amazing educational highlights. Come discover, experience & learn alongside us! Discover some of Europe’s Edventures Highlights…..
Roadschooling our children across Europe’s major natural, cultural and historical highlights has allowed us to seek out new travel/education or adventure opportunities across Europe. Hence the phrase ‘Edventures‘! Now, everyday brings a new outdoor classroom / playground / family adventure for us to discover together as a family. 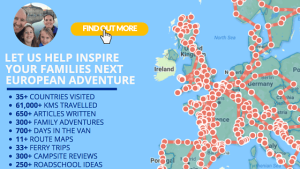 So if you’re considering planning a day out, your own road trip or just an extended family holiday, we hope it gives offers ideas for educational family fun across Europe. WANT TO LEARN HOW WE ROADSCHOOL OUR KIDS…? sounds interesting? why not check these resources out? We’ll be adding more videos from our experiences across Europe. So here’s a quick glimpse of the type of short videos you’ll find on our YouTube channel on our road schooling journey. We hope you enjoy them. If you did, we’d love a comment afterwards so we can hear your thoughts too!